You know my friend Annie Downs? Of course you do. She is famous in the blog world, famous in Nashville, famous in my heart, and now, famous in honest-to-goodness book print. When I first met Annie several years ago, she was in the beginning stages of writing a book. She wrote and wrote and wrote, more words than I have ever strung together. She poured her heart and her time and her stories into this book – and now it’s finally ready for you to read. Here’s the crazy thing: so much of the good that is Annie translates directly over to the way that she writes. I’m only a few chapters into this book, and reading it feels like we’re sitting across the table from each other, hashing out the good, the bad, and the ugly. The girl is gifted. 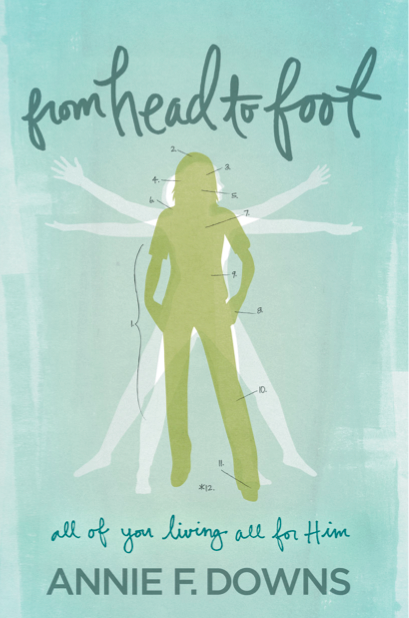 For those of you who can’t get enough of her hysterical, heart-felt blog, you will definitely want to grab a copy of “From Head To Foot.” It’s geared toward young women – and chances are that you either are a young woman or you know a young woman, so order one or five or enough for all of the high schoolers at your church. It’s a really cool thing to watch a friend’s dream come true. Annie Downs is doing one of the many things that she’s meant to do – writing good, truthful, life-giving words, and sharing them with others. It’s a big deal. It’s a great story. I’m so proud to call her my friend. I ordered it on Monday. I hope I get it in time to read it before I send it to my cousin’s daughter who’s the exact right age for it. Her birthday is in January. Reading it now and I’m finding myself challenged and encouraged in new ways which proves this is not just for the young ones. What a great writer that Annie Downs is. Love her! i love annies book.. it was awesome i am rereading it!! !